2. All wiring throughout the golf cart must be upgraded to a minimum of 4 AWG. We recommend our Wire Upgrade Kit for most vehicle types. 3. Must upgrade to a heavy duty Solenoid. We recommend our Solenoid Kit (kit includes solenoid, resistor, diode and mounting brackets). 4. This controller has an extended housing. From end to end, it measures about 10 inches to the end of the Buss Bar. 5. This is an economical hunting buggy solution. 6. Currently the highest torque motor in the aftermarket! Excellent for hunting Buggy and lifted vehicle applications. 7. Beware: This motor will not fit into this golf car without fabrication work or at least a 3 inch lift kit being attached. This is because the wheel base on this style golf car is too narrow and the motor is too long. Shock may need to be temp. disconnected. 8. Must upgrade to a heavy duty F&R Switch. *** Vehicle performance specs are compared to the standard factory performance. Several factors can effect the performance. Some are battery conditions; tire size, tread type and air pressure; and varying environmental conditions. Standard factory speeds normally run between 12 - 14 MPH!!! All vehicle speeds noted are calculated on flat ground. Adding Larger tires normally adds between 2-3 MPH. If you do not see the performance you require, please call (315) 701-0635. We often are capable of making non-standard motors. 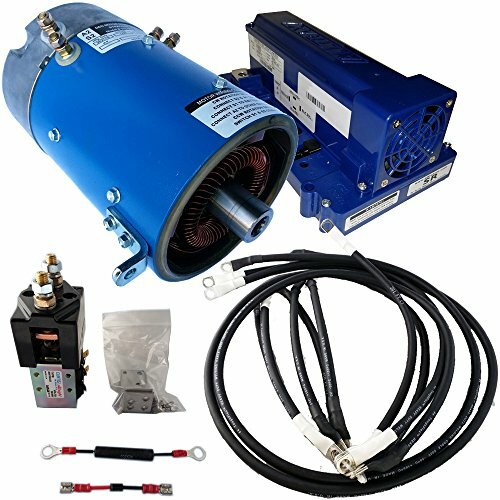 DISCLAIMER - BY PROCURING THIS ELECTRIC MOTOR, THE CUSTOMER AGREES THAT THEY HAVE ANSWERED YES TO ALL OF THE QUESTIONS LISTED ABOVE. OTHERWISE NO PRODUCT LIABILITY CAN BE PROVIDED OR ASSUMED. IF YES IS ANSWERED TO THE ABOVE QUESTIONS, THEN THE APPLICATION IS APPROVED BY D&D. If you have any questions about this product by D&D Motor Systems, contact us by completing and submitting the form below. If you are looking for a specif part number, please include it with your message.